It’s said that if you read about it then you’ve experienced it. One of my life’s desires is to go to London, England. Well… I had the wonderful opportunity to speak to a gentleman, by every right, from London. Needless to say I loved his accent and it took all of my will power not to want to join him in his dialect. In our conversation, all of which I could not place here in print, I learned of a man with a sole desire to please the Lord and to follow Jesus’ example in reaching the masses. It is truly wonderful to know that God is bigger than you and me, bigger than race and bigger than geography. Here’s a snippet of our conversation…Enjoy! Detroit Gospel: How you doing? Bazil Meade: I’m good. I have choir rehearsal in a few hours time. DG: What did you want to be when you grew up? DG: Are you pretty good at it? BM: I use to be…at that age they were trying to take me to the professional teams for tryouts but my parents were not having it. And that kind of destroyed my hopes. DG: …oh, OK. Well, Bazil, tell us here in Detroit a little more about you and the London Gospel Choir. BM: We are the London Community Gospel Choir and we were formed in 1980. There was a need here in the United Kingdom for the Gospel Community to be catered [to] for the musical taste. If you turn on your radio or TV or recordings, there’s nothing here in Britain that’s catered to those people. So, you’ll hear Pop music, Blues, Reggae, Soul but no Gospel. I suppose that is one of the things that kicked off the conversation between myself and three other choir leaders. We thought that maybe one way we can address this in London was to begin highlighting the quality of talent that was in our Churches. We have to overcome the obstacles (what we call here, “the labels”)… in that we attend Churches with different names and different denominations. On the outset we decided… let us look at the areas that we agree on…we all call on the name of God and that we all worship Jesus and we see Him as Lord and King. Let us focus on Him! And let us forget about our differences, the variations and dress code and being baptized in the name of the Father, Son and Holy Spirit or just in the name of Jesus. Let us focus on what we agree on. And that’s been 24 years ago. DG: So, what can we look forward to in the future with the London Community Gospel Choir? BM: We’re still breaking ground here because the Choirs’ ministry isn’t necessarily for the Church… we’re a choir that gets invited to Corporate functions, at Rock festivals, Blues festivals, to people’s weddings, Seminars, Hospitals, and Prisons. Therefore, we felt our ministry is very much beyond just the Church. Where, if we follow the Bible, if I’m correct is right where we should be; preaching the word. Which surprises some of our hard-nosed Christians because of the impact we have on those we’ve shared stages with, all because they felt that we shouldn’t have been there. We have to go back to the Bible where Jesus says to go ye therefore out into the world. Not in the safety and security of your prayer meetings. Take that power and go out into the world and share the faith with people. DG: Do you see yourselves touring the States at all? BM: I’m hoping something may come out of the contact between you and Mary [Editor of DG.com] and the Detroit Gospel.com family. The record label that we’re signed to called “Kingsway” which is the biggest label here in the UK. I try not to get my hopes up on things like in those areas. I just try to connect with folks like Mary who is well connected and hope to make things happen as a way of introduction to the States. I have been there personally but not as a choir. We tend to tour Europe, Japan and Africa… where Gospel isn’t as easily heard. DG: Are you received well? DG: What is your take on Holy Hip Hop or Gospel Rap? BM: I think we need to embrace it all… all generations have their own voice. It’s the music of the young people. It’s the soundtrack for that period. We can’t hold on so tight that we say that we have to remain old. Or to remain to the way things were for 50 to 60 years ago. That’s not progress, we’re not catering to those that we must cater to; the young people of today. DG: Is it popular there in London? BM: It’s embraced by the young people both in and out of Church but not like it is there in the States. But it’s growing. DG: What is your favorite food? DG: How do you know that Jesus is real? BM: The life change that has happened in my life… only Jesus could have done it. This is how He’s proven that He’s real to me. DG: You have 30 words to use to save the world and what would you say? BM: Seek out a relationship with God the creator. There’s no better way to live one’s life on this planet. It surpasses any material gain one can get in this life. DG: It has been wonderful talking with you Bazil. BM: It is good to finally talk with you too Anthony. DG: Even though there is this huge ocean between us, I’m learning more and more that God is real and He’s everywhere. BM: Traveling opens the mind and enables me, certainly. [It] forces me to appreciate God’s goodness because I see God in every person, every culture, and in different forms. We feel that God is English, or American, or West Indian but this is not true. God is every culture, every person. We were created in His image. He’s (and I like your word…) awesome! DG: Yes, He certainly is. 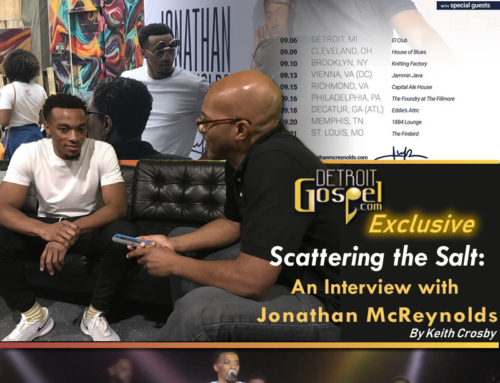 Thank you so much for taking time out of your busy schedule to talk with Detroit Gospel.com. DG: You have a wonderful day. BM: Good talking with you Anthony. Bye bye. Editor’s Note: Detroit Gospel.com would like to thank Bazil Meade for sharing his thoughts with us…and the world. It is our sincere hope that the Lord makes a way for the LCGC to bring their unique ministry through music to the U.S. and around the globe. In 1982 a dream and a vision came alive. Revd. Bazil Meade, with the help of Lawrence Johnson, Delroy Powell and John Francis made a mark in history pioneering the first concert gospel choir in the UK. LCGC nurtured over the next two decades more than 200 members from all areas of London and its suburbs. Trying to fit LCGC into a neat slot is virtually impossible. They are adaptable, flexible and perform dynamic sounds creating rich harmonies whether they are a small or large group. LCGC is known for their up-tempo gospel flair, swing-beat, R&B, traditional and soulful arrangements, with their invigorating choreography and vocal gymnastics. LCGC are outstanding to watch!